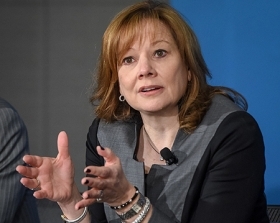 CEO Mary Barra: "We were on a path to do this anyway." DETROIT -- General Motors said today that it will buy back $5 billion in shares by the end of 2016 and return "all available" free cash flow to shareholders, a move that sidesteps a proxy battle with activist investor Harry Wilson. GM said that Wilson has agreed to withdraw his nomination to GM's board of directors at its June meeting and drop his shareholder proposal that called on GM to repurchase $8 billion in stock by mid-2016. "We always said that the actual number was negotiable," Wilson said in an interview of the $5 billion buyback. "The thoughtfulness and transparency the company brought to the capital-allocation framework was really refreshing and gave us a lot of comfort." The move avoids a potentially distracting proxy battle for GM, which still is trying to move past its recall crisis of last year. It also likely eases the pressure on the company from shareholders, who have grown increasingly frustrated that GM wasn’t returning more of its liquidity to them in the form of dividends or buybacks. Wilson, a former member of the federal automotive task force that restructured GM in 2009, notified CEO Mary Barra on Feb. 3 of his plan to call for a share buyback and seek a board seat. GM has been weighing Wilson's proposal, formally made in a regulatory filing on Feb. 9. Corporate credit ratings service Moody's called GM's move a "negative credit development," but said GM's ratings and stable outlook are unchanged. Moody's rates GM's credit at Baa3, the lowest level of investment grade. "This program weakens GM's positioning at the current rating level and will likely delay any potential consideration for an upgrade," Moody's Senior Vice President Bruce Clark said in a statement today. Standard & Poor's, the other major ratings agency, also reaffirmed its current GM credit rating of BBB-, which is also the lowest level of investment grade. "The ratings affirmation reflects our view that the company's liquidity, credit metrics, and steady positive free cash flow prospects through the end of 2016 are sufficient to absorb outflows related to the announced shareholder actions without meaningfully impairing its credit quality," S&P credit analyst Nishit Madlani said in a statement. GM said the $5 billion buyback would begin immediately and conclude before the end of 2016. GM's shares rose $1.12, or 3.1 percent, to close the day at $37.66. The company said it plans to keep a cash balance of $20 billion and return "all available free cash flow" to shareholders, while maintaining its investment-grade rating. GM previously had said that it was targeting a cash balance of between $20 billion and $25 billion. CFO Chuck Stevens told reporters during a briefing today that $20 billion is enough to get GM through even a severe downturn. He said roughly half of the cash cushion is a day-to-day requirement and half is reserved to protect the company from a sharp drop in auto sales. Stevens called the $5 billion buyback an "initial manifestation" of the company's broader capital-allocation plans. GM had $25.2 billion in cash and marketable securities and $12 billion in available credit as of Dec. 31. Even though it boosted its dividend last month by 20 percent, to 36 cents a share, some shareholders have been critical of its cash stockpile. GM also said it will target a return on invested capital of at least 20 percent "through investments in world-class vehicles and leading technology." It will begin reporting that measure in its quarterly results, starting with the first quarter. The company's return on invested capital hit 20.2 percent in 2013 but fell to 15.4 percent last year, hurt by added costs related to GM's 80 safety recalls. It was 16 percent in 2012. Barra said GM and its board had been working on a broad capital-allocation strategy even before Wilson came forward with his proposal. "We were on a path to do this anyway," Barra told reporters. "We found that there was some important points to make [to shareholders] to provide greater transparency and clarity" about GM's operating performance and capital-allocation plans. In his proposal, Wilson was representing four hedge funds that own about 1.9 percent of GM's common shares: Taconic Parties, Appaloosa Parties, HG Vora Parties and the Hayman Parties. Wilson stood to receive a share of the profits from the group's investment in the automaker in the form of fees.